France has emerged as the top country for Aero India. With representation from 43 companies, it has outstripped US and Russia at this year's event. 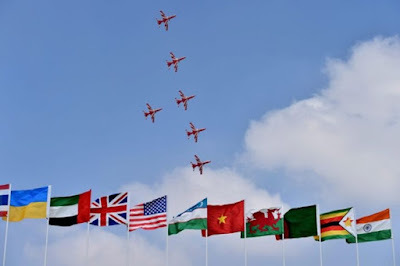 Aero India will beheld from February 20-24, 2019 at the Airforce Sattion, Yelahanka will seee participation of over 136 companies from 20 countries. However, this year French companies have out stripped US and Russian companies. These include Dassault Aviation, Dassault Systemes, Airbus, French Air Force and Thales. All together more than 300 exhibitors, including top global and domestic players from the defence industry, have confirmed their participation in Aero India 2019, a defence official said. Aero India 2019 will see participation of top fighter-jet manufacturers, defence equipment makers and companies related to the sector. All activities related to Aero India 2019 have been made online — be it booking of tickets or selection of space for stalls, the official said. The participants can arrange business to business meetings and book conference rooms online. “With nearly 50 days to go for Aero India, we already have 308 exhibitors. They include 178 domestic and 130 foreign players. We have generated a revenue of Rs 62 crore from the bookings so far. “There will be no cheque transaction for Aero India as all payments have been made online. The arrangements correspond to the best practices in the world,” the official added. There will also be a mobile application for Aero India 2019 show that will guide the users about the event. Tickets for “business days”, February 20, 21 and 22, will cost Rs 2,750 each. Tickets for general visitors will cost Rs 1,800. Rs 600 will be charged for air display. On-the-spot tickets will cost Rs 250 more, the official added.